Rucaparib (Rubraca®) is a small molecule poly(ADP-ribose) polymerase (PARP) inhibitor with potent activity against PARP-1, -2 and -3. It is approved in the USA and the EU for the treatment of adult patients with BRCA-mutated ovarian cancer who have been treated with two or more lines of chemotherapy. Rucaparib is also approved in the USA and the EU for use as maintenance therapy in adult patients with recurrent or relapsed ovarian cancer who are in a complete or partial response to platinum-based chemotherapy. 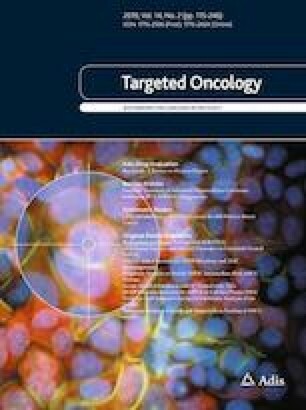 Based on an analysis of patients across two phase II clinical trials, rucaparib displayed clinical activity as third- (or later-) line treatment of BRCA-mutated ovarian cancer, with rucaparib-treated patients having a confirmed objective response rate of 54%. Furthermore, as demonstrated in the randomized, placebo-controlled, phase III ARIEL3 trial, rucaparib significantly improved progression-free survival when used as maintenance treatment in patients with platinum-sensitive ovarian cancer. Rucaparib had an acceptable tolerability profile in clinical trials in women with ovarian cancer. Common adverse events were generally manageable with dose modification and/or supportive care. Thus, currently available data indicate that rucaparib is a useful addition to the options available to clinicians for the treatment of advanced ovarian cancer, in both the treatment and maintenance therapy settings. The manuscript was reviewed by:M.C. Cristea, Department of Medical Oncology and Therapeutics Research, City of Hope National Medical Center, Duarte, CA, USA; S. Ferrero, Academic Unit of Obstetrics and Gynecology, IRCCS Ospedale Policlinico, San Martino, Genoa, Italy; M. Markman, Eastern Regional Medical Center, Cancer Treatment Centers of America, Philadelphia, PA, USA. During the peer review process, the manufacturer of rucaparib was also offered an opportunity to review this article. Changes resulting from comments received were made on the basis of scientific and editorial merit. Matt Shirley is a salaried employee of Adis/Springer, is responsible for the article content and declares no relevant conflicts of interest. International Agency for Research on Cancer. Cancer Today; 2019. http://gco.iarc.fr/today/home. Accessed 22 Jan 2019. National Comprehensive Cancer Network®. NCCN clinical practice guidelines in oncology (NCCN Guidelines®): ovarian cancer including fallopian tube cancer and primary peritoneal cancer (version 2.2018); 2018. http://www.nccn.org. Accessed 07 Feb 2019. US FDA. Rubraca® (rucaparib) tablets: US prescribing information. 2018. http://www.accessdata.fda.gov/drugsatfda_docs/label/2018/209115s003lbl.pdf. Accessed 26 Feb 2019. European Commission. Rubraca: summary of product characteristics. 2019. http://www.ema.europa.eu/documents/product-information/rubraca-epar-product-information_en.pdf. Accessed 26 Feb 2019. Ledermann J, Sessa C, Colombo N. eUpdate—ovarian cancer treatment recommendations; 2016. http://www.esmo.org/Guidelines/Gynaecological-Cancers/Newly-Diagnosed-and-Relapsed-Epithelial-Ovarian-Carcinoma/eUpdate-Treatment-Recommendations. Accessed 07 Feb 2019.